Three evenings on the rocks. 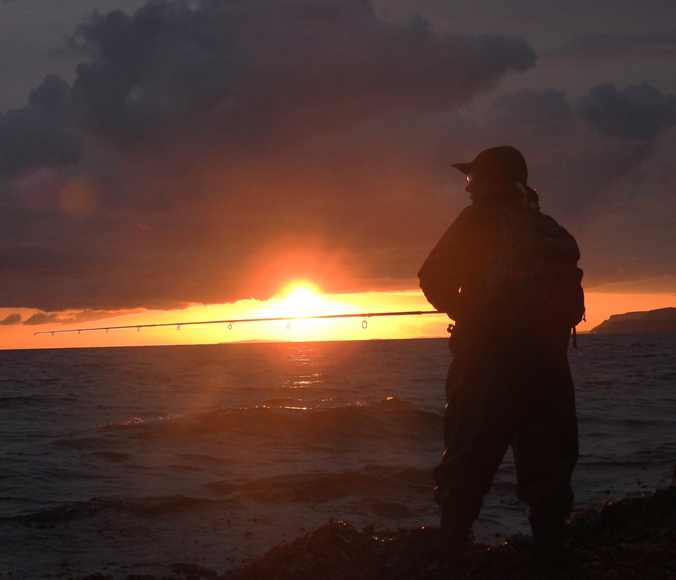 A few of my pals tend to exchange information about the fishing - I guess most anglers do something similar. 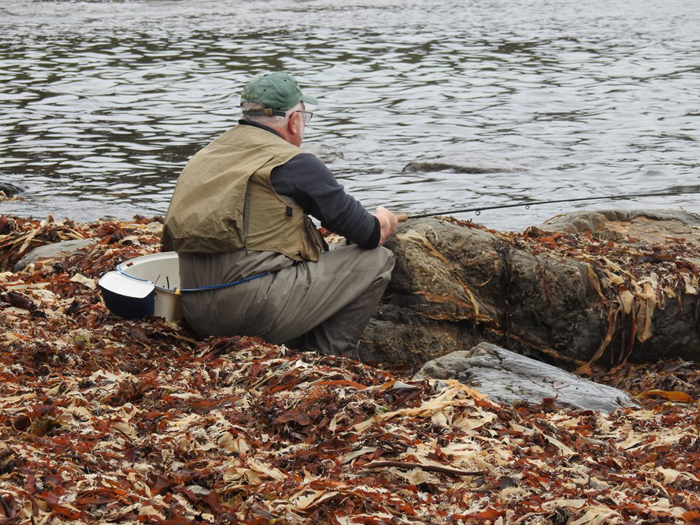 Of course, sometimes we fish together and sometimes on our own so Email is a useful way of passing on what's happening. On the first decent 'maggot' tide of the recent series Bill and Nigel went to see if there was anything about. 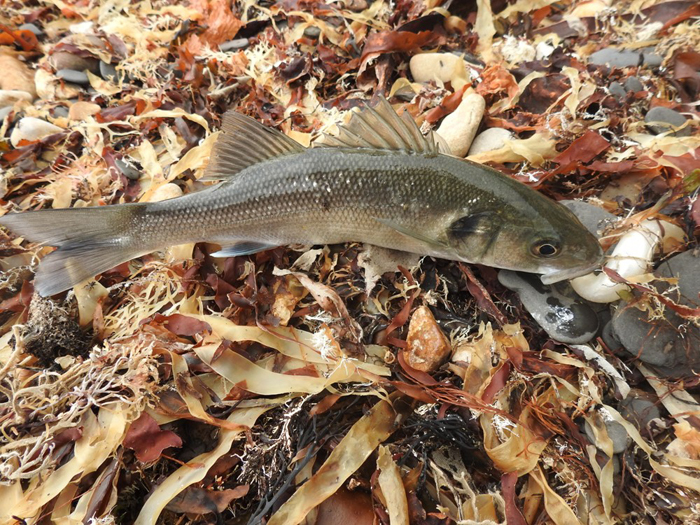 It wasn't good but they fished for a couple of hours on a flat calm sea and after about half-an-hour twenty or thirty mullet turned up. 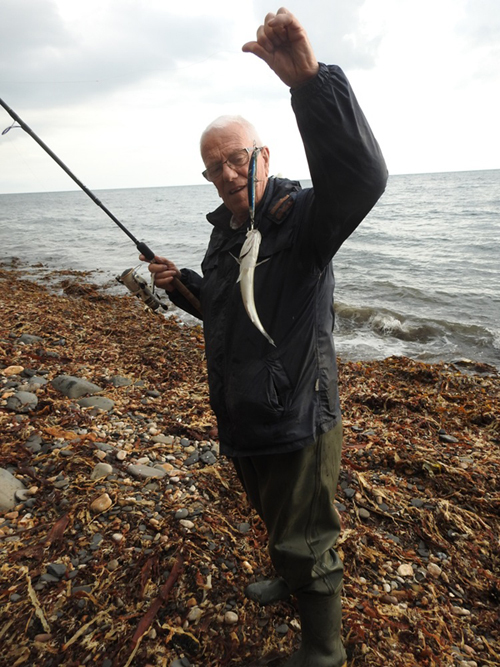 Bill spun with his reliable SlugGill lure but caught nothing (he did manage to lose a lure by fishing an area even shallower and snaggier than usual though). 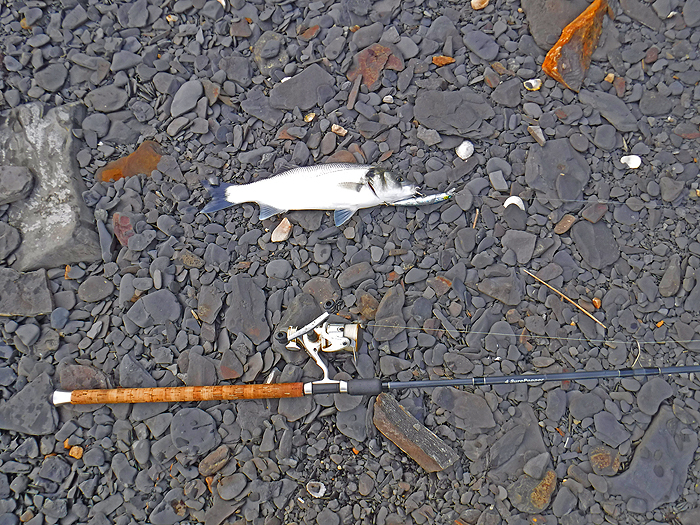 Nigel fly fished with his latest model of 'star' maggot fly and landed a 'sluggish' mullet of just under three pounds. The following evening I was able to join the lads and we went to another weedy, maggoty spot a mile or two to the east of the previous place. 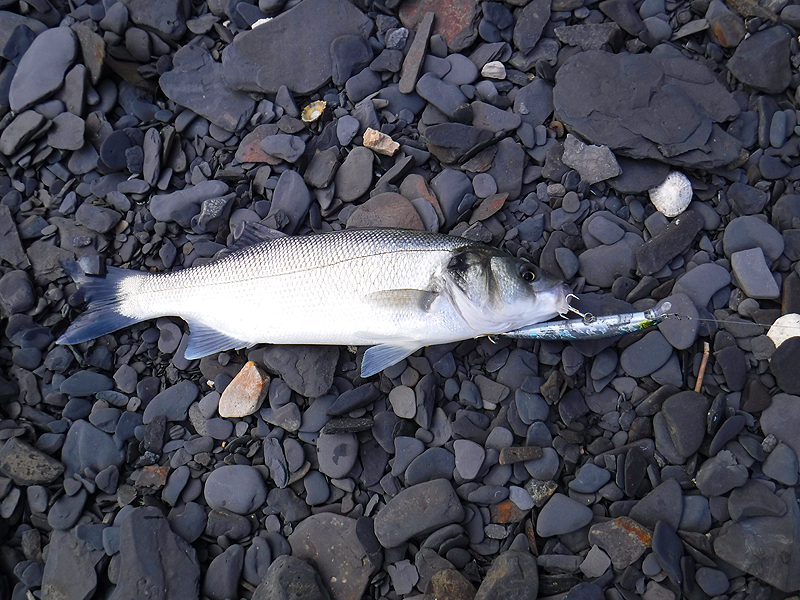 This time there was a bit more of a chop on the water and as the tide neared high water lots of small mullet (and bass) turned up to feed at the surface. We all fished slightly different tactics and this time Bill had a schoolie on an Albie Snax, Nigel used a long, thin 'rubber thingy'? 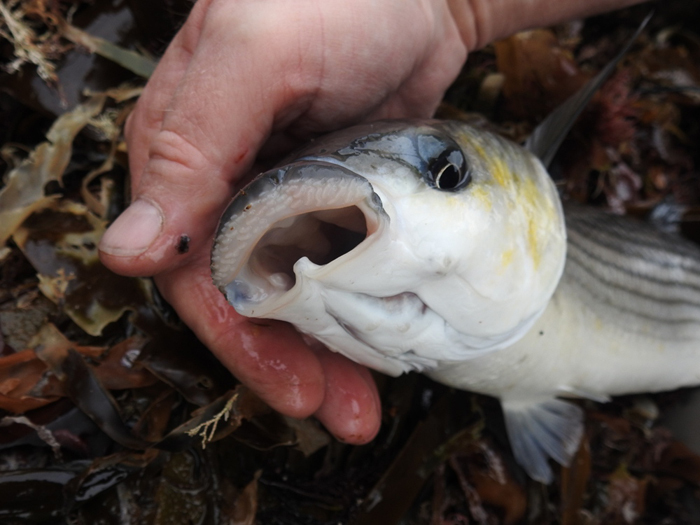 and had a couple of schoolies. He also tried the fly again but it was very difficult fishing in the wind and waves and the fish weren't interested in artificial flies so he caught nothing this time. I spun, mostly with a Maria Chase plug (the one I had the snook on in Tobago) and totalled four little schoolies plus one of about two-and-a-half pounds. It was a nice sunset. The following evening I went on my own to the previous evening's spot, Bill couldn't go and Nigel tried yet another place several miles to the west. This time it was much rougher and the tide was higher and I got thoroughly soaked wading back at high water. However I did manage six bass this time. Just as before five of them were tiny and one was again in the two to three pound category. 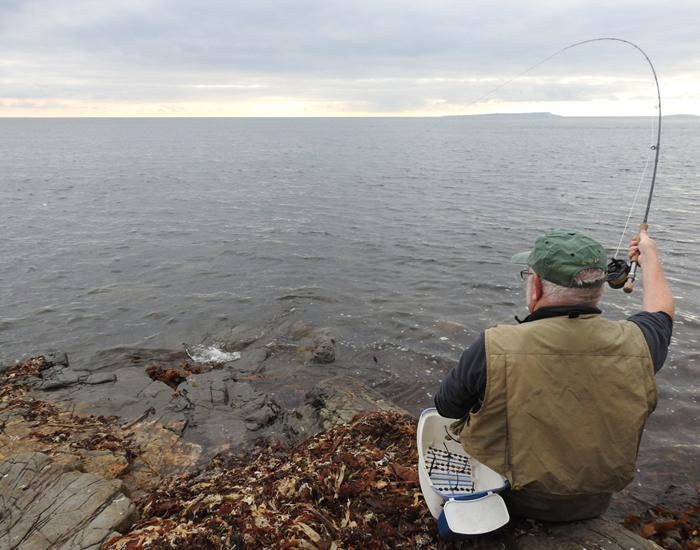 It was much too rough, windy and weedy for fly fishing and I gave it up after a few casts. 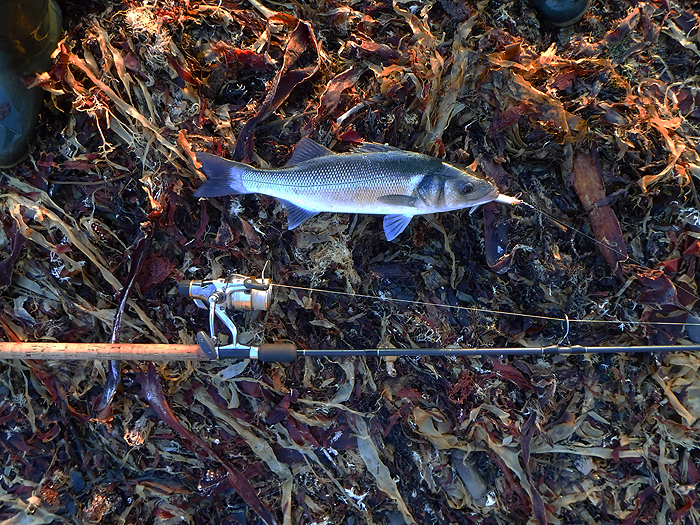 This time I stuck to a J9 Rapala for my spinning. Nigel did rather better at his spot and managed ten bass up to a couple of pounds or more and saw one much bigger fish (a proper bass!) striking at sand smelts a few feet out. He eventually lost his successful lure - the 'rubber thingy' - and switched to a 100mm SlugGo which was apparently useless. He's obviously very relaxed but the fly rod's well bent. The second evening - Bill's tiny bass on the Albie Snax. Bill insisted in taking this one of me. Bass not much bigger than plug. My better bass on the Chase plug. My best fish on the roughest night.